Who won through tonight to Saturday’s final? Serbia, Moldova, Hungary, Ukraine, Sweden, Australia, Norway, Denmark, Slovenia, Netherlands. Who missed out? Russia, Romania, San Marino, Georgia, Poland, Malta, Latvia and Montenegro fail to make the cut. Social media suggests tonight was underwhelming compared to the more impressive first semi-final. 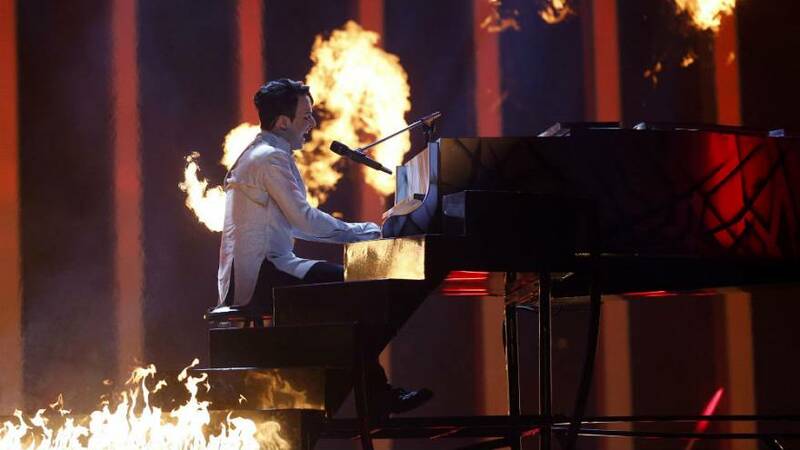 Russia fails to make it through again while Ukraine’s act wins the unofficial best entry award: the singer emerged from a ‘burning’ piano. Norway won through by recycling its winner from 2009: Belarus-born Alexander Rybak. Dancing robots fail to do the trick for San Marino, who go out. Which countries are already through? Albania, Austria, Bulgaria, Cyprus, Czech Republic, Estonia, Finland, Ireland, Israel and Lithuania. UK, France, Germany, Italy, Spain and hosts Portugal qualify automatically for the final.